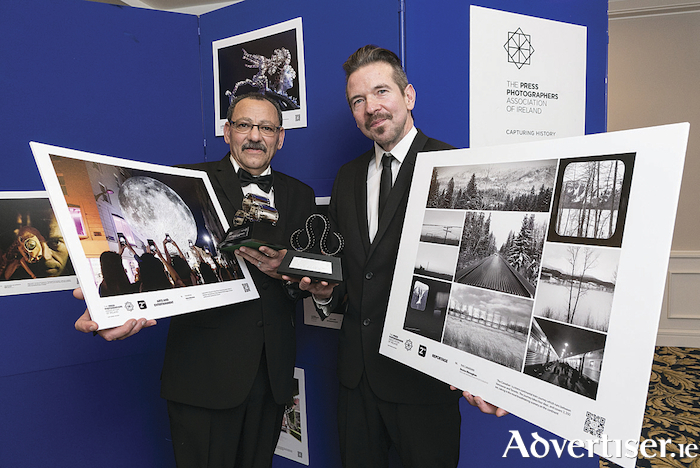 Galway photographers Hany Marzouk and Declan Monaghan pictured with their images and their awards at the PPAI event. Three Galway photographers were rewarded for the excellence of their work at the annual awards of the Press Photographers Association of Ireland last weekend. Local freelance Galway photographers Hany Marzouk and Declan Monaghan picked up prizes for images and reportage. Mr Marzouk won his award for a shot from last summer’s Galway International Arts Festival; while Mr Monaghan was rewarded for his reportage picture essay entitled The Canadian, featuring stunning images of wintry Canada. Former Galway Advertiser photographer Brenda Fitzsimons, now employed by the Irish Times won an award for her image of Dr Rhona Mahony, Master of National Maternity Hospital Holles St. The overall award of ‘Press Photographer of the Year’ 2019 was presented to Tom Honan. Tom, a freelance photographer from Dublin started his career with Inpho Photography before moving on to work for a time with The Irish Mail on Sunday. Tom is no stranger to the PPAI Awards stage having received 9 awards to date in previous years. His winning portfolio this year features work commissioned by The Irish Times. Awards were presented across nine categories; news, daily life & people, nature and the environment, politics, sports action, sports feature, portrait, art & entertainment and reportage, alongside a dedicated award for multimedia. The collection of images chronicles the year 2018 in Ireland covering all the highs and the lows including the many sporting events both at home and abroad, the momentous Papal Visit as well as the catastrophic weather events including the infamous ‘Beast from the East’.